The annual BRO appreciation dinner was held over the recent long weekend at the Canberra Yacht Club. Thank you to all of our BROs and volunteers who made the past season possible. Congratulations to Edwin Bien and Geoff Northam, the first recipients of the new BRO of the Year Trophy. 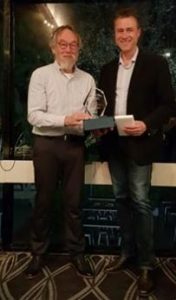 The photo below shows Edwin Bien receiving the award from Nick Hunter. Geoff Northam was not, unfortunately, able to attend the event. Vince McMahon presented the attending BROs with Gold Jubilee Medallions. If you were invited to the dinner as a BRO but could not attend, please contact Vince for a medallion.